Systems: Several notable systems within th ship give greater and larger benefits then others. Description: Designed per special requiest, the custom order saw one fo the Yachts being worked on and designed to the dimensions of a massive Herglic client. The dimensions, the rooms, the seating and the doorways with a sato holographic chair made for him as the captain all built from the ground up. Aquatic misters and waterproof console coverings all around allow aquatic species to be moistened without drying out in space and the better environmental controls. Other requests such as a gym using the variable gravity plating for work out, rooms that can set up and house normal humans as well as a small pool one can swim in. A special force dead brig as well as a machine shop for working on equipment are on the ship. All of the suites and packages set up with the client in mind and keyed for him to make the ship his own personal home or for whatever purpose he has in mind.Other parts of the ship such as the systems and suites are built up as well, from the internal defensive systems tht have been made to protect the ship. The shipwide neural net that Meran Mechanics supplied for them is another layer to help protect it with the ability to work and interface more with the ship. Its custom interior for a herglic van become a small thing so no one is out of place on the ship. Matsu Ike - Having taken the time to look through every linked item, I have to say that I’m impressed with the amount of effort you’ve put into this submission. However, while I appreciate it, there is going to be some more things I will have to ask you before I consider giving this my green stamp of approval. Going down the submission, I’m going to have to ask that you list the Blaster-Proof interior of the Absorbital material as a Strength along with your Executive Internal Suite. While minor overall, it’s better to have everything linked in this submission adequately represented, than not at all. I’m afraid that your armament rating doesn’t encompass what you’ve listed and linked. Having Ten Blaster Cannons that have the ability to swap over to Ion cannons at will isn't bad. But, adding in Two Bomblet Generators that have been noted to carry Two chutes per generator and have the capacity to generate an infinite amount of bombs. Alongside Ten Ion Encumbrance Packages that all together have roughly 5,000 nano missiles and 500 “tags” that can disable a hostile craft’s deflector shield - I see that as being heavily armed for a 100m ship. So, I would greatly appreciate it if you replaced the Moderate rating with High. If you would like to keep the Moderate rating, I’d recommend cutting One of the Bomblet Generators and Five of the Ion Encumbrance Package(s). 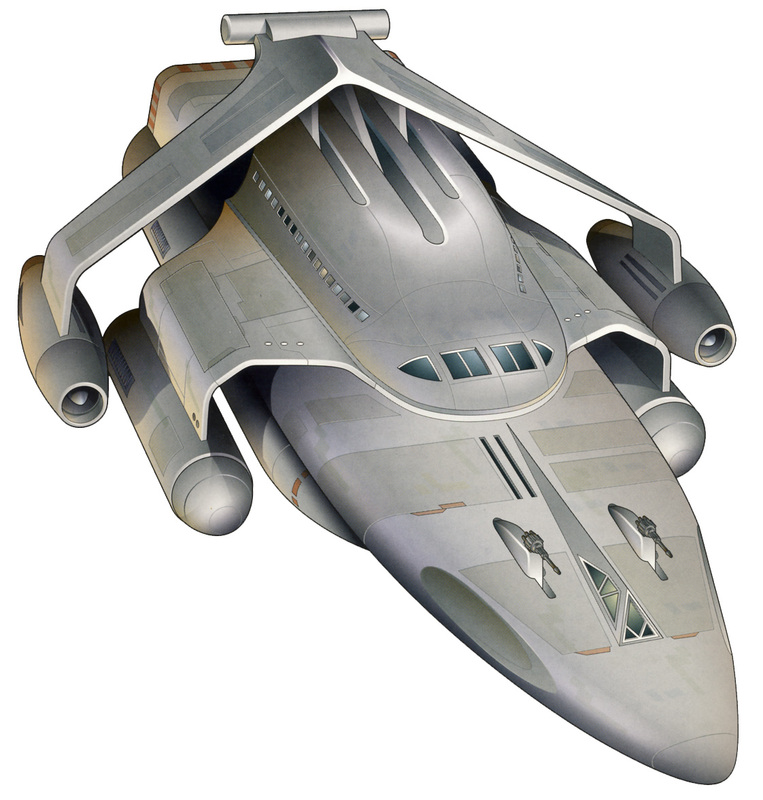 Also, I’d like for you to expand the Bomblet Generator piece in the armament section with Two Chutes so that it’s clearly labeled in the submission itself, rather than hidden in the Wookieepedia article. With your defenses, I don’t think moderate is an appropriate rating considering everything that’s linked. The PLOT shielding itself has Four overlapping barriers in place, as well as the booster being able to increase the strength of the shield layers by 25%, not to mention a fast-acting backup system... If those four layers of the PLOT shields weren’t differing in function, then I would say that those alone would’ve been enough to constitute a Moderate rating. However, as you’ve added in an Anti-concussion field generator, a de-ionizer, a cap-drain, warhead countermeasures (Of which I assume is all three listed in the article itself. ), and a damage reduction armour component - that to me would be accurately listed as High. Is your Tractor/Pressor upgrade Light, Standard, or Heavy? Whichever one it may be, please add that to your submission. With your Saotome Recharger (Shield recharge), the Saotome Engine Suite (Most notably the Booster), Saotome Executive Internal Suite (Internal Automated Weapons and Defenses), and the Sato Holochair (Command Overrides, and Biometrically Locked.) - I will require these to be fleshed out in both of your Strength and Weakness sections, as there are items within those linked submissions that need to be addressed for this starship. For your strengths, please remove the Custom Fit - as that’s not a strength. If anything, it should be listed in the Special features and paired with the Living Module, Executive Suite, and Holochair. The Calming Effects and Lightside strengths can be combined as they are essentially the same. For your weaknesses, please remove Sie (I assume that's a typo for Size.) - as that’s not an appropriate weakness for this submission. It’s more flavour text than a balancing item. If you’re looking to retain the ratings you have or follow through with my suggestions, I will request that another one or two critical weaknesses be added to this submission to balance out your Strengths and Weaknesses. That’s all I have for you at the moment; please feel free to make any comments, questions or concerns and @mention me when you’ve completed the myriad edits. Matsu Ike - No worries about forgetting the math, that’s what we’re here for! If you’d like I can leave this open for you to add in any other weaknesses you desire, but if you can’t think of any that’s fine too. Just let me know, and we’ll go from there.